A few days have passed since I wrote over 50,000 words during the 30 days of November. 30 days and 30 nights of literary abandon. Indeed. 1) It's hard to turn off your internal editor but when you do, magic can happen. So can crap. Still, if you end up with more magic than crap, you're ahead of the game. 2) The world doesn't stop spinning if laundry piles up and counter tops are jumbled. The NaNo veterans remind us that when we signed up for NaNoWriMo, we set the audacious goal of writing a novel in 30 days, not scrubbing surfaces clean. Word. 3) Support groups work. 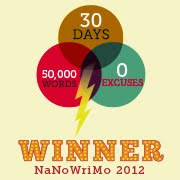 I did not participate in NaNoWriMo write-ins but I did join a virtual group that was awesome. We encouraged each other and shared successes. Like Ernest Hemingway says, "Writing, at its best, is a lonely life." A support group makes it feel less so. 4) Friends and family can help. Let them know what you're doing. When I left the Thanksgiving table to sit behind my computer and bang out words, they gave me a pass. In fact, they wanted to know how many words I managed to do that day. 5) What you start out to write may not be what you end up with. My NaNo novel went in directions I never planned. It took sprawling tangents with wild subplots; new, interesting characters showed up with rich back stories - it was a fascinating process. 6) Just write. And write. And write. Don't stop. Some people dig writing challenges, some swear by Zen Writer or Dr. Wicked's Write or Die. I tried them all when the muses weren't smiling on me. The point is, keep your fingers tapping no matter what. A guy in our support group wrote a scene in his 2009 NaNo novel where a father told his son a bed time story. That story turned into a children's book that he's currently shopping around. You never know what will come out of the experience. 7) Embrace the rewrite when you're ready. I crossed the 50K finish line but lost steam. IMHO, my story could be good and it started strong, but I lost the love. I plan to put the manuscript in a drawer for several months and forget about it. I hope to reread it with fresh eyes one day, edit the heck out of it, tack a decent ending onto it and decide what to do next. But I did it! The list is specific to me and my experience as a first time NaNoWriMo participant. I'd love to hear how you did! Thanks for the encouragement, friends. Fantastic advice -- and so on the mark! Congrats on your big finish, and I can't wait to read the finished product someday!